The ultimate goal for calf raisers is to raise a healthy, profitable replacement for their herd. Crystal Creek’s Swift Start® Calf & Heifer Program consistently provides the jump start calves need to become a productive part of the herd. The Swift Start® program consists of a line of milk replacers, texturized calf feeds, calf pellets and calf and heifer minerals that are formulated with industry leading technology and manufactured with the highest quality ingredients available. Calf raisers on Crystal Creek’s Swift Start® Calf & Heifer Program see less scours, better average daily gains and smooth transitions after weaning. Texturization. Crystal Creek® texturized calf feeds consist of a combination of calf pellets, corn, oats and molasses. Compared to pelleted starter, texturized calf feeds provide better rumen stimulation and development, increased saliva production, and reduce the risk of ruminal acidosis. Safe Starch Levels. Calf feeds that are over 40% starch pose a higher risk to calves of developing acidosis. Crystal Creek® texturized calf feeds are approximately 30% starch hence a much lower risk of acidosis. Cleaned Phosphorus Source. Our cleaned phosphorus source has significantly lower levels of contaminates such as iron, fluoride and aluminum, all of which can tie up nutrients and interfere with calorie utilization/feed efficiency. Natural Coccidiostat. Yucca Schidigera is an effective, natural coccidiostat comparable to an ionophore without the negative side effects ionophores have on fiber fermentation. Yucca has been proven to increase immune function and increase lower G.I. tract digestion/ nutrient absorption. Yucca also enhances protein utilization and maintains healthy rumen bacteria. 100% Polysaccharide Chelated Trace Minerals. Crystal Creek® uses 100% polysaccharide chelated trace minerals because these types of trace minerals are 100% bioavailable to the animal. Using a more absorbable trace mineral source leads to improved average daily gain, feed efficiency and immune support. 100% Selenium Yeast. Crystal Creek® uses 100% Selenium Yeast as our selenium source because this option for selenium is nearly 100% bioavailable to the animal. Selenium is important for immune function, muscle growth, and prevention of white muscle disease. Strong Vitamin Fortification. Crystal Creek® fortifies their calf feeds with strong levels of vitamins to support optimum immune function, growth performance and helps reduce potential issues such as ringworm, pinkeye and respiratory issues. A calf raiser on Crystal Creek’s Swift Start® Calf & Heifer Program was recently approached by their previous supplier of calf grain, urging them to switch back to their old program. This prompted the producer to run their own calf feeding trial to compare the two brands of calf feed. Calves were all weighed at birth and given at least 1 gallon of good quality colostrum (minimum of 23% Brix). All calves were fed Crystal Creek’s Swift Start® 25/18 Calf Milk Replacer. Calf Shield® and Check™ calf products were added to the milk replacer, in accordance with the complete Swift Start® program recommendations. Grain was introduced at three weeks of age. One half of the calves were fed Crystal Creek’s 22% texturized calf feed and the other half were given Brand X’s 22% texturized calf feed. The amount of calf feed fed and refused was weighed every day to determine the pounds of calf feed eaten by each group. All calves were weighed again at weaning. 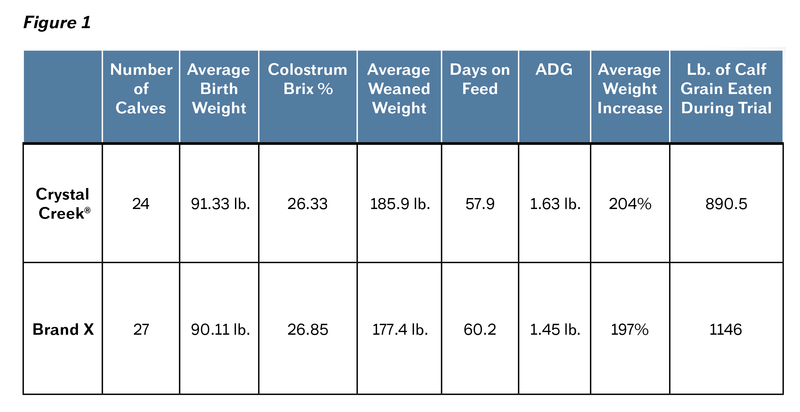 (Figure 1) This chart shows calves on the Crystal Creek® program weighed 8.5 lb. more at weaning. Calves were weaned 2.3 days earlier, gained 0.18 lb. more per day and ate 5.34 lb. (or 12.6%) less feed during that time. The producer initially thought that Brand X was the best choice based on the information of cost per bag being less than Crystal Creek’s. Fortunately, the calf raiser knew to not just look at cost per bag. When comparing feeds, it is important to evaluate other parameters such as amount of feed consumed, average daily gain and overall animal performance in order to determine the real value of a bag of feed. This calf feeding trial was beneficial to quantify and validate what other calf raisers using Crystal Creek’s Swift Start® Calf & Heifer Program are seeing on their own farms. Challenge your herd by using Crystal Creek’s Swift Start® Calf & Heifer Program. Call our specialized staff to explore options and benefits for your farm, today.